On Tuesday, January 24, 2017, the Claremont City Council passed a resolution affirming Claremont’s long-standing commitment to diversity and safeguarding the civil rights, safety, and dignity of all people, in response to the Pitzer College Student Senate’s efforts to make our community a more welcoming and inclusive place. It was a very proud moment for the students of Pitzer College who helped draft and introduce the city’s resolution. You can read more about our work and the City Council’s vote in the Inland Valley Daily Bulletin. 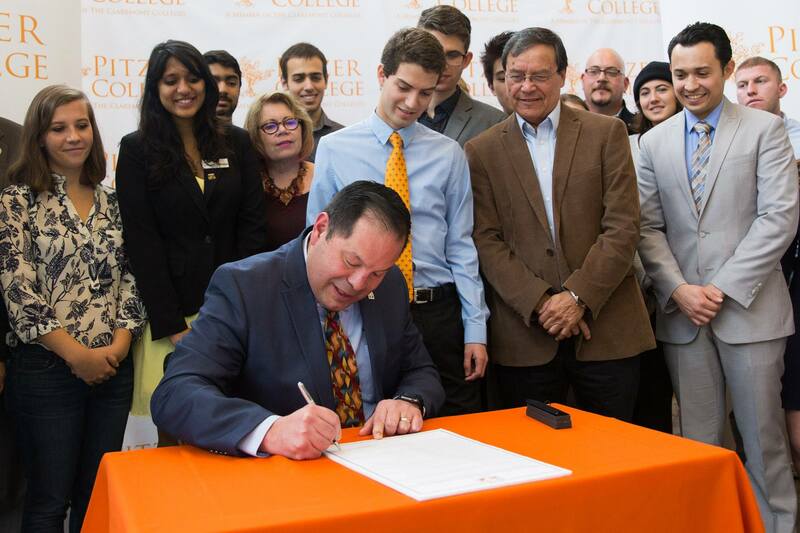 As part of the 2017 Student Voice Week at Pitzer College, Claremont Mayor Sam Pedroza officially signed the city’s resolution on campus in honor of the Student Senate’s leadership in making this happen. Students, staff, and faculty joined in celebrating this historic moment in our community.